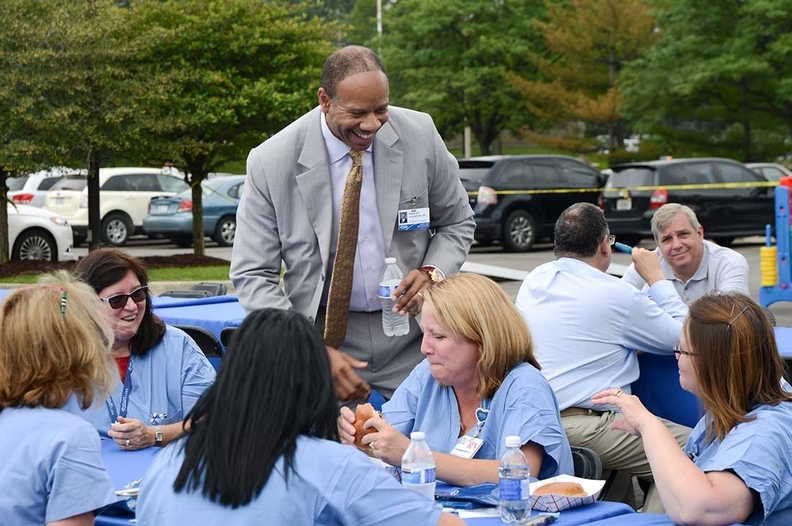 Henry Ford Health System President Wright Lassiter III celebrates the 100th anniversary of Wyandotte Hospital with employees last summer. When Wright Lassiter III assumes the helm this year at Henry Ford Health System in Detroit, he will inherit a fully functioning workplace and leadership diversity program. But that puts him in rare company among healthcare providers. Despite years of dialogue, education and awareness, the industry has been painfully slow in promoting minorities to senior executive and trustee posts. “Our C-suites and boards too often do not reflect the communities we serve,” said Lassiter, who was recruited from Alameda Health System in Oakland, Calif., in 2014 to succeed longtime CEO Nancy Schlichting. Ethnic and racial minorities comprise more than 30% of all healthcare patients nationally, according to figures compiled by the Institute for Diversity in Health Management, an affiliate of the American Hospital Association. Yet, minorities comprise about 14% of hospital board members, according to a 2013 institute survey. That number was unchanged from 2011. Results from a 2015 survey are expected to be reported in June. A similar lack of progress was displayed in the C-suite. According to that same survey, 12% of executive leadership positions were held by minorities, unchanged from 2011. For first-level and mid-level management positions, minorities held 17% of those jobs in 2013, versus 15% in 2011, the survey showed. Dr. Ram Raju, CEO of the NYC Health & Hospitals, formerly the New York City Health and Hospitals Corp., said health systems that serve diverse populations need diverse leadership to truly optimize access and care. The traditional ways of sensitizing clinicians to these types of cultural differences with a few PowerPoint slides and a lecture “are not going to work,” he said. Before joining NYC Health & Hospitals, Raju, 65, led the Cook County Health and Hospitals System in Chicago for about three years. Lassiter said Henry Ford Health has a full-court press underway to improve diversity inside the system, including among the highest ranks, as a means for improving community care. At the time Lassiter left Alameda Health in 2014, he said minority members represented 35% of the public system's board of directors. At least once a quarter, usually more often, about 20 of Henry Ford Health System's top executives meet as part of a formal diversity forum that the system recently established to develop strategies and track progress in diversifying its workforce and leadership, Lassiter said. The highest level of the organization is represented, including the entire senior executive team, the presidents of each of the system's five hospitals and its managed-care plan, as well as other top clinical managers. Leading the charge is Dr. Kimberlydawn Wisdom, a senior vice president of community health and equity, who is a board-certified emergency medicine physician and former surgeon general of the state of Michigan. Since its implementation at Henry Ford Health 18 months ago, the forum has launched several initiatives to improve patient access in Detroit, and to determine better ways to serve the metro area's diverse population, including a high concentration of Arab patients, Wisdom said. “We are aligning all strata of our organization to serve that diverse population,” she said. For example, to tackle a Detroit infant mortality rate that rivals many developing countries, Henry Ford deployed two health professionals in each of three Detroit neighborhoods to provide better access for new and expectant moms, and to raise awareness about pre-natal and early childhood health, Wisdom said. The result: not a single infant death for preventable causes in those neighborhoods. Another key initiative asks each new patient to self-identify his or her race and ethnicity so that the system can better see morbidities in certain populations in order to suggest new means of prevention and care, Wisdom said. Lassiter said the forum is monitoring a host of diversity and disparity of care issues on dashboards to ensure initiatives are staying on track. Efforts to increase the number of minorities holding healthcare leadership posts mean expanding the pool of candidates considered for those posts—a challenge that takes systematic and creative approaches, Raju said. He said mentoring of minorities is crucial to help them navigate the system and get them on the radar screen of managers and trustees. Many professional organizations for healthcare managers promote mentoring and internships among their campaigns to increase minority participation in the highest ranks of hospitals and systems, Raju said. One of the bright spots of the Institute for Diversity in Health Management's survey is that the pipeline of minorities in middle management is growing as formal and informal diversity efforts pay dividends, said Tomas Leon, the institute's CEO. Those individuals are now getting the training and preparation they need to advance further, he said. But Raju says mentoring needs to start in high schools, even middle schools, where young people can be coaxed into considering healthcare careers and advance under the wings of established managers through college and into the professional ranks. “There's an imbalance we need to bridge,” Raju said.